The story of the Willow Brewery begins at Bonvill, Maryhill, near Glasgow, with the birth of Andrew Walker, who was to become one of the largest colliery owners in Scotland. Andrew later had a son called Peter Walker, whom we will call Peter Walker (Senior) to distinguish him from his son. Peter Walker (Senior) was born at Ayr. In his youth he moved to Liverpool and began the business of a brewer, eventually opening his own brewery. This venture profited not only himself but also two of his sons; Peter Walker of Wrexham (born 19th October 1820) and Sir Andrew Walker of Warrington. We will be concentrating on the younger Peter Walker who was sent by his father to learn his trade as a brewer at Joseph Clark’s Cambrian Brewery back in the 1830s. After leaving the Cambrian Brewery Peter Walker started several wine and spirit establishments in Liverpool and its neighbourhood. Peter Walker (Senior) gave control of his breweries to his son Andrew, which naturally disappointed his son Peter, who then bought the Willow Brewery from Mr. Richard Evans in 1860 and founded Peter Walker & Co. Ltd. He rapidly expanded the Willow Brewery into the largest brewery in town; a 7,000 square yard site with a 140 foot tower. By 1865 the increasing demand for Walker’s beer led to him making plans to erect additional premises and on Wednesday, 18th October 1865 the foundation stone was laid for the new brewery. It was to adjoin the old Willow Brewery and to face Tuttle Street, though the principle front in an architectural point of view would be inwards towards the yard. 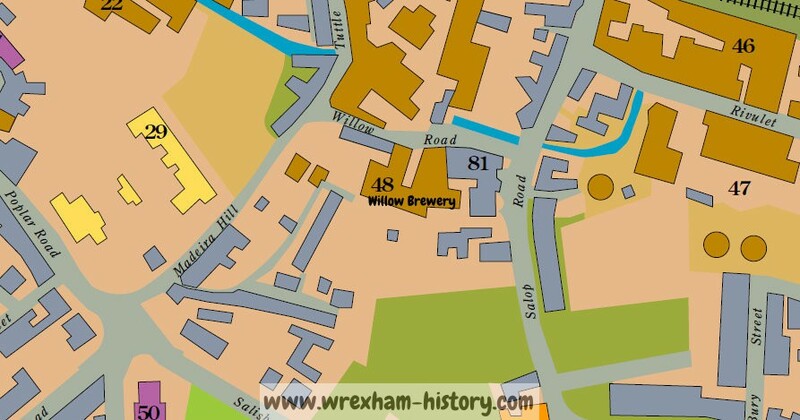 In modern terms The Willow Brewery was situated on the corner of the present day St Giles Way and Tuttle Street, to the rear of what is now the Matalan store. The pre-1865 brewery was at that time brewing no less than 500 barrels of beer each week but it was hoped that the new premises adjoining the old brewery would produce almost 1,600 barrels a week. It was planned that the new brewery would cover an area of 11,000 feet. It was to be built from brick with stone facings; the greatest elevation to be 100 feet. The Tuttle Street elevation was to be 62 feet by 120 feet long, with the principal entrance on the Tuttle Street side being under a capacious archway. Mr. Walker’s men put in the foundations and cellarings and the building was designed by Mr. Hugh Davies, borough surveyor of Wrexham. The chimney was to be designed in an ornamental style, reaching an elevation of 140 feet. Inside the building there was to be a shelf 60 feet long by 32 feet wide for washing casks, with malt store rooms over it supported by iron pillars. On the ground floor of the intermediate part of the brewery was to be the malt-crushing room. This part of the brewery was to be 100 feet high with a reservoir at its summit, capable of holding 350 barrels of water. This water was to descend from floor to floor, undergoing different processes at each level until it became the pure extract without ever needing to be pumped back again. There were to be two mash tubs capable of mashing 3,000 bushels weekly and two large coppers which would boil 60 barrels each, but would hold 80 barrels. A refrigerator was to be constructed on a new principle, and the dimensions of the cooler was to be 90 feet by 38 feet. The area of the cellars was 100 feet by 40 feet, with square room and vat room above. The company then adjourned to the new malt room, where they partook of a substantial dinner, prepared by Mr. Murless, of the Wynnstay Arms Hotel. The room was lit by gas for the occasion and was decorated in a very profuse and tasteful manner. The chairman (Mayor of Wrexham) gave the usual loyal and patriotic toasts, which were duly honoured. Mr. T. Rymer then gave the toast of the evening, adding that he was not sorry to say that Mr. Walker was absent as the reason was that he had gone to Scotland to be married. There followed many complimentary toasts and after enjoying a very pleasant evening, the company broke up at an early hour. Peter Walker employed a large number of staff and of course they would have been encouraged to behave in a manner that wouldn’t bring disgrace to their employer. In 1866, however, police Superintendent Bradshaw charged three of Mr. Walker’s employees, namely Jones, Smith and Owens with having left two carts and a waggon, loaded with bricks, with two horses on each, upon the highway near the Traveller’s Rest on 24th April. The three men were in the house drinking and Superintendent Bradshaw remonstrated with them. He was prepared to overlook the case, but they repeated the offence that evening. The men were each fined thirteen shillings. They had no money with which to pay the fines so the clerk volunteered to pay it for them and they repaid him the following day. In August 1866, a committee meeting was held at the Council Chamber, Guildhall, Wrexham. The surveyor reported that plans of the brewery in Tuttle Street had never been furnished to his office. A motion put forward by the Chairman (Mr. Councillor Eyton Jones) and seconded by Mr. William Rowland was passed and it was ordered that a letter be written to Mr. Walker requesting him to furnish them with such plans. Peter Walker became the Conservative mayor for two years running; 1866-7 and 1867-8 and supplied the town with a ceremonial mace. He also got into a long running rivalry with another brewer, Thomas Rowlands. In 1869 a portrait was commissioned from Charles Mercier of Peter Walker, ex-mayor of Wrexham. The intention was to present it to Mrs. Walker. It was to be paid for by subscription got up by a few of Mr. Walker’s friends as a token of their esteem for him as a Citizen of Wrexham. Also in 1869, Peter Walker of the Willow Brewery presented each member of the Wrexham police force with a goose for their Christmas dinner. They did well that year, because Mr. J. Clark of the Cambrian Brewery presented each of them with a bottle of wine. On Saturday, 18th October 1873, a football match took place on Wrexham Racecourse between sixteen members of the Wrexham club and sixteen of Chester Training College. The game was going well until Roger Williams, a worker from Peter Walker’s brewery, twisted his leg and broke it just below his knee. Dr. Eyton-Jones attended to Mr Williams, who was taken to his residence in Salisbury Park. The game did not proceed after the accident. The Willow Bridge was built in 1877 by Peter Walker to carry Salop Road over the River Gwenfro, near the junction of Willow Road, which formerly led to the Willow Brewery. Mr Peter Walker was also a property owner, but unfortunately not all of his houses were kept up to standard. 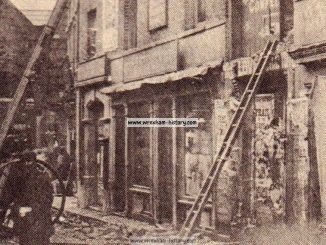 In April 1877 the surveyor reported that some houses in Mount street and Tuttle Street, owned by Peter Walker and the Wrexham Brewery Company were unfit for human habitation. Orders were made that after the expiration of three months those houses must no longer be inhabited. On Tuesday, 29th January 1878, Wrexham Town Council met to discuss a chimney proposed to be erected by Mr. Peter Walker, brewer. Several of the members contended that it ought to be higher than intended. After an opinion given by the town clerk, the plans were not allowed to pass. On Saturday, 5th October 1878, Mr. Peter Walker treated his workmen to a trip to Birmingham. They travelled in two carriages which had been attached to the 07:33 train. The party arrived at Birmingham at 10:20 and were joined by others from Liverpool and Wolverhampton. They split into two groups, one to be managed by Mr. Bagnall (Peter Walker’s manager at Birmingham) and the other under the charge of Mr. Crawford, one of the brewers. The former party visited Aston Hall and the other party visited the world-famed works of Messrs. Ellkington and Co. The whole party assembled soon after noon at Holte’s Hotel for a substantial spread provided in a handsomely-decorated dining-room. Mr. Walker’s health was heartily drunk by all. After visiting some of Mr. Walker’s licensed premises the parties gathered at Snow Hill Station for 7:00pm and returned home, the Wrexham workers arriving home for 09:58pm. The day had been delightfully fine and all seemed to have enjoyed themselves. Following his retirement, Peter Walker (Senior) had returned to his native town of Ayr, to continue his interest in coal mining and brewing. Peter Walker (Senior) died on Saturday, 15th November 1879 at St. Lawrence House, Ayr. He left an accumulated fortune of almost a quarter of a million pounds. He had four sons (one of whom had died) and two daughters. On Friday, April 30th 1880, Mr. Peter Walker gave his May Day banquet, as May Day occurred on a Saturday that year. Mr. Walker presided; on his right was the Hon. G. T. Kenyon and on his left was the Mayor of Wrexham (Alderman E. Smith). Mr. Kenyon proposed, “The town and trade of Wrexham,” coupling with the toast the name of Mr. David Jones, butcher and grazier. David Jones responded in “an able and humorous speech”. Councillor Fred Jones intended shortly to put on a Pullman’s Car to enable inhabitants of Rhos to return home safely. On May Day 1880 the usual May Day celebrations took place in Wrexham. Foremost were the fine bay horses belonging to Mr. Peter Walker, brewer. As per annual custom, every man in Mr Walker’s employ was presented with a new hat, coat and trousers, all of which were trimmed with blue ribbon. Many of the men wore rosettes and the “true blue” upon their hats. On Monday, 27th September 1880, Ann Davies of Rhosllanerchrugog pleaded guilty at the police court to stealing a barm sheet, valued at 5s 6d from Peter Walker’s Willow Brewery. Two other sheets had been stolen previously. The woman was fined 40 shillings, or a month’s hard labour in default, as Peter Walker did not wish to press the charge. In 1882 Peter Walker decided to move his brewing empire to Burton-on-Trent in Staffordshire. Some say this decision was taken because he had not being picked to serve a third period as mayor in 1881, but more likely it was based on the prospect of better business opportunities in the Staffordshire town. On 17th February 1882 the foundation stone of his new brewery in Burton was laid. The only link to Wales was to be a Welsh goat on the weather vane at his Burton brewery, as Peter died soon after at his home in Coed-y-glyn on 13th April 1882, aged 61, only two months after laying the foundation stone for his new brewery at Burton. He left £1,000 to help build the National School on Madeira Hill, a sum of money roughly equivalent to £800,000 in today’s money. It is to Peter Walker’s credit that, due to his perfect business arrangements and choice of managers, his brewery continued to run smoothly during the long and painful illness that led to his death. His funeral procession took place on Tuesday, 18th April 1882 and was one of the largest ever seen in Wrexham. 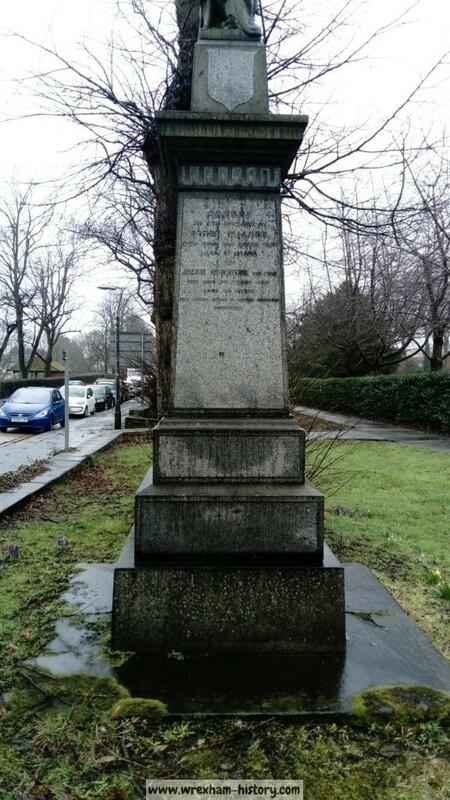 It included not only his own family, but also members of the town council and friends from Liverpool, Birmingham, Wolverhampton and other places. 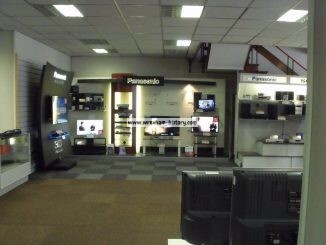 Business in Wrexham was suspended at noon-day with all shops being either wholly or partially closed. Blinds were drawn at nearly every house and cottage. The church bells were muffled and flags floated at half-mast; notably from the Guildhall; the Zoedone works; Mr. J. C. Owen, Madeira Hill and of course the Willow Brewery. Wreaths were sent from many sources, including a large floral cross from Lady Williams Wynn and Miss Williams Wynn; wreaths from Mr & Mrs Trier of St. John’s Wood, London and from Miss Stewart of Edinburgh and from the Office Staff of the Willow Brewery and from the workmen. 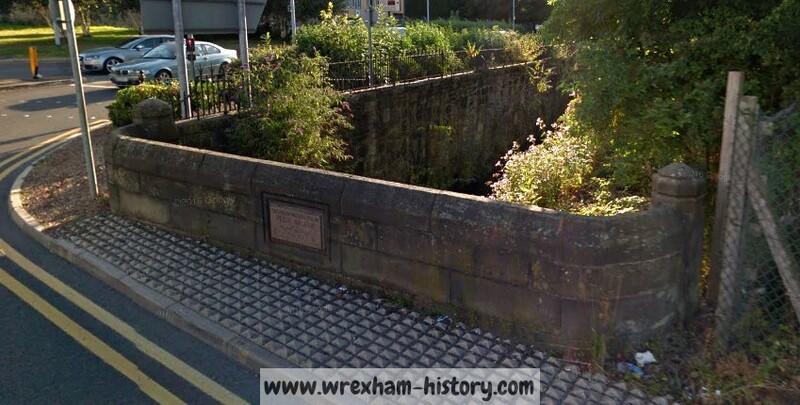 Peter Walker was interred at Wrexham’s Old Cemetery, Ruthin Road, in the vault his first wife was buried in. Long before the appointed time, all streets and avenues leading to the cemetery were thronged by large crowds of spectators, which numbered several thousand by the time the funeral procession left Coedglyn at half past twelve. The extensive new brewery at Clarence Street in Shobnall, Burton-on-Trent was opened in 1883. 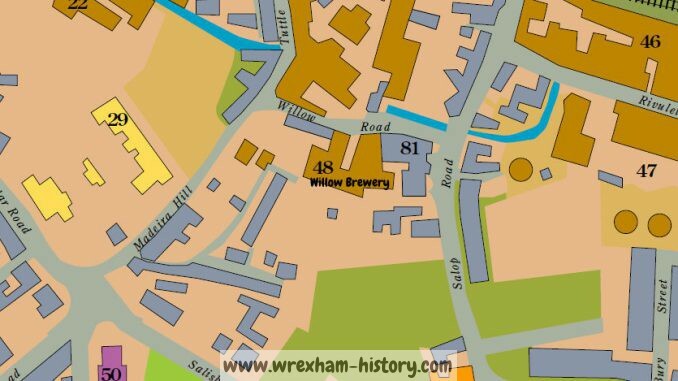 Walker’s Willow Brewery at Wrexham closed down in September 1883 and was purchased by the Wrexham Council for their main offices and depot. On Friday, 23rd November 1883, at the Willow Brewery, a sale was held by Messrs Jones and Sons, who were acting under instructions from the Executors of the late Peter Walker Esq. Numerous items were offered for sale, including three small steam engines, a mortising machine, a five-inch lathe, two saw benches, a billiard table, earthenware, and an immense quantity of glass, cutlery, etc. On Tuesday, 30th June 1896, the Council members sat in committee to consider making an offer to the Willow Brewery for their asking price of £8,000. Arrangements were made for an inspection of the premises prior to considering the offer. In October 1896 Mr. Ll. Hugh-Jones wrote to the council to ask if he could be furnished with a copy of the report they had obtained upon the proposed purchase and adaptation for municipal purposes of the Willow Brewery. Mr. Hugh-Jones objected that the discussions had been held in secret without consulting the ratepayers. Mr. Bevan proposed that they give Mr. Hugh-Jones a copy and also that they send a copy to the local press if they saw fit to do so. The Deputy Mayor said any ratepayer would have a right to visit the municipal buildings to see the report. The Town Clerk read a letter from Messrs. Hore, Monkhouse and Hore, Liverpool, the vendor’s solicitors, stating that the trustees of the late Mr. Peter Walker wanted to have a tenancy of the malt kilns in the Willow Brewery yard and the office buildings, at £70 per annum for two years, and at the end of that time the option to continue as annual tenants or to take a seven years’ lease if they preferred. The town clerk said they had arrived at the arrangement for purchase on the basis of a letter from Messrs Hore, Monkhouse and Hore, dated 9th June 1896 and that the letter hadn’t mentioned the office buildings. He felt that if the council agreed to the vendors’ request both the malting kilns and the office might be out of their possession for a term of nine years. It was decided to rent the malt kilns at a sum of £70 a year, but not the office. Mr Lockwood’s report on the Willow Brewery said that the land was in a central position and was composed of 7,096 square yards and consisted of buildings that were mainly of recent construction. He considered the asking price of £8,000 to be reasonable. He mentioned that the public swimming baths were to be placed at the corner of Tuttle Street and Willow Street. Access to the gymnasium was to be from Tuttle Street over the brook at the end of the bath. The public room was sixty-five feet long and thirty-nine feet wide. After deducting ten feet for the platform they would be left with space to seat 418 persons. The surveyor gave Mr. Lockwood his requirements for the corporation Stables Rolling Stock. They needed stabling for twelve horses; a hospital for two horses; covered space for five tumbler carts; covered space for two horse sweepers; covered space for six ordinary carts; covered space for two water vans; covered space for seven 4-wheel carts; covered space for one steam roller and a disinfector for clothing. The total space required for this was 2,436 square feet. The offices by the gateway in Willow Street comprised an enquiry office (15 feet x 4 feet); a pay office (14 feet by 5 feet 6 inches); a private office (14 feet by 13 feet on ground floor and the same accommodation on the upper floor. The existing malting was two storeys in height and measured 147 feet by 40 feet, comprising an area of 5,880 feet on each floor, exclusive of the kilns, which added 440 feet to the area on the ground floor. Those were left entirely unappropriated and were available for letting, after the whole requirements of the corporation had been satisfied. On 15th February 1899, a meeting was held of the Willow Brewery Fixtures Sub-committee. The Committee was shown a lengthy list of the late Mr. Peter Walker’s estate, received from the local agent of the trustees. The title of the list was, “Inventory of Fixtures and Fittings at the Willow Brewery and Offices , Wrexham, claimed by the Vendors, January 1899.” The Town Clerk read an old letter dated 9th June 1896 written to him by the trustees’ solicitors stating that “£8,000 will be accepted for these premises, as advertised for sale in October 1892, with the exception of any plant or things which were on the premises at that time, and which may have since been removed, subject to a contract to be approved by the registrar”. 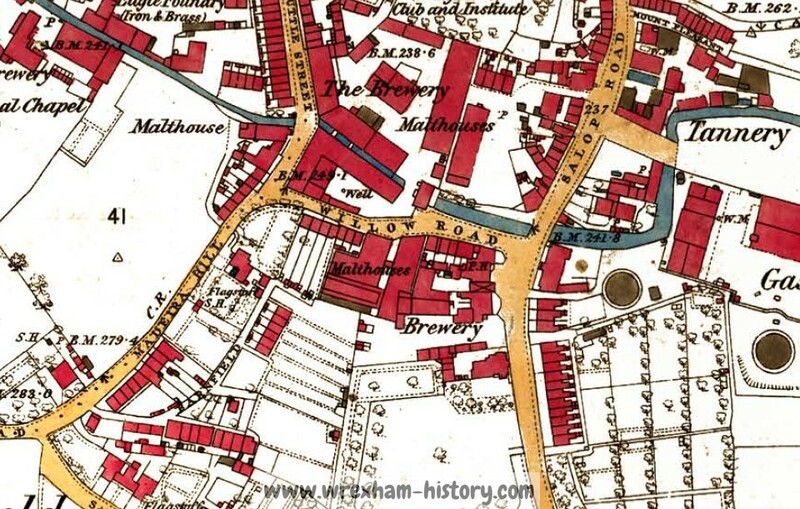 Alderman Samuel, when proposing the confirmation of the minutes of the Willow Brewery Fixtures Sub-Committee, said they had considered everything to be in connection with the purchase of the Willow Brewery and had bought everything appertaining to it at that time. Alderman Samuel was of the opinion that everything belonging to Mr. Walker’s trustees now belonged to them and this must be established before going ahead with the purchase completion. Mr. Taylor seconded the recommendation and said he’d understood that the Trustees had surrendered everything. The Town Clerk explained that there’s been a misunderstanding when the instructions were prepared. He had in fact discussed it only the previous day with the vendors’ solicitor, Mr. Monkhouse, who had agreed that some things had carelessly been removed some time ago. Thanks to Mr Monkhouse, certain items such as loose piping had now been included in the list of what belonged to the Council. The Borough Council built the famous Tuttle Street Baths on the land. Gutted by fire in the 1970s, the site was cleared soon after and demolished, leaving only the railings, still standing alongside the river Gwenfro.